Brand New Brackets From A&M Hardware! Our Hybrid Bracket is now available with 9”, 15", or 21" Support Arm. They are available in the 1.0” and 1.5” version in Black and White. Concealed and Extended Concealed Brackets with a ½” support arm for the ultimate in concealability. C and EC Flat 9”, 12”, 15" & 18” available with a 1” or 2” wide support arm. C and EC Flat 21" and 24” available with a 2” wide support arm. Brackets are available in Black and White. 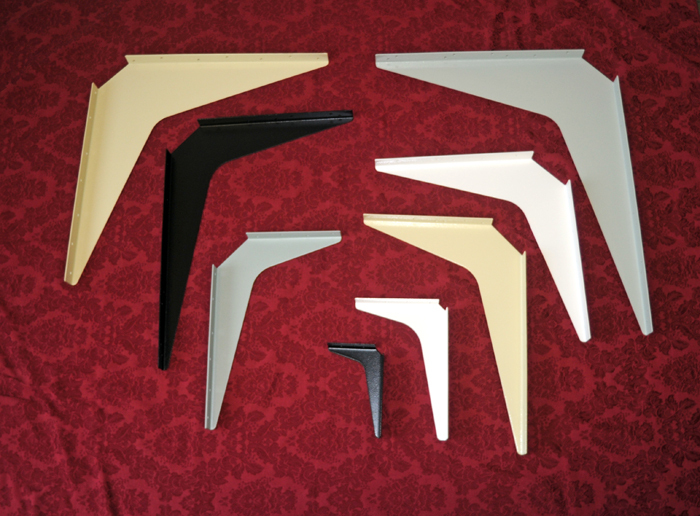 We are offering the Veined Powder Coat Brackets for the same price as the Standard Colors. 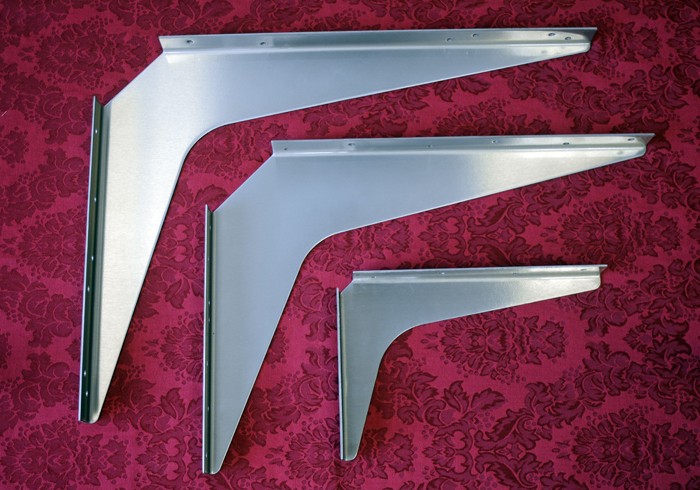 We have added 3 NEW sizes to our line of Steel Workstation Brackets. Our previous warehouse was bursting at the seams. We have tripled in size allowing us to better fulfill all your bracket needs. A big Thank You to all of our customers for helping us grow! 1165 Strickler Road, Mount Joy, PA 17552. Workstation brackets are available as imports or "made in USA"
Price savings vs Stainless Steel. New color BROWN now available in all sizes in the Regular Imported Line. Are you an architect, builder or contractor looking for high quality support brackets for a number of different applications? Look no further. A&M Hardware, Inc. is proud to offer high-quality cantilever shelf support brackets that easily support more than 1,000 lbs. If you are looking for additional strength and/or concealment, check out our concealed and extended concealed brackets. The vertical mounting arm of the bracket is completely concealed behind the drywall, and the horizontal arm supports 1,800 pounds to 7,960 pounds per pair, depending on the arm length. We also offer a hybrid bracket which can be surface mounted or concealed for maximum flexibility. This bracket is available in 1.5 inch and 1.0 inch versions. We stock stainless steel brackets in imported or made in the US versions. We offer our concealed brackets in a made in the US version. We are proud to offer an aluminum bracket as well. Be sure to check out our new ADA countertop support brackets, which make ADA countertop installations easy. Mount them to the wall, attach your countertop and install your face panel with the supplied spring clips. The face panel can be removed easily, with no tools, for quick access to the plumbing. All A&M support brackets are for use with wood studs or metal studs with wood backing. Look to the original A&M Hardware brackets for all of your bracket needs. © 2019 A&M Hardware, Inc. All Rights Reserved. Web Design by Sharp Innovations, Inc.